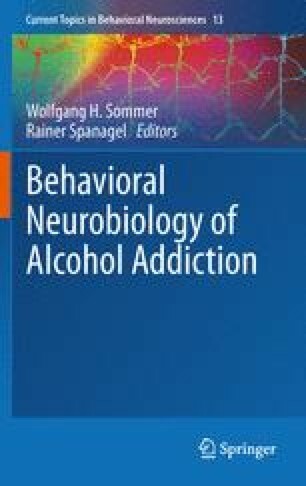 Recent brain–imaging studies revealed that the development and maintenance of alcohol dependence is determined by a complex interaction of different neurotransmitter systems and multiple psychological factors. In this context, the dopaminergic reinforcement system appears to be of fundamental importance. We focus on the excitatory and depressant effects of acute versus chronic alcohol intake and its impact on dopaminergic neurotransmission. Furthermore, we describe alterations in dopaminergic neurotransmission as associated with symptoms of alcohol dependence. We specifically focus on neuroadaptations to chronic alcohol consumption and their effect on central processing of alcohol-associated and reward-related stimuli. Dysfunctional reward processing, impaired reinforcement learning and increased salience attribution to alcohol-associated stimuli enable alcohol cues to drive alcohol seeking and consumption. Finally, we will discuss how the neurobiological and neurochemical mechanisms of alcohol-associated alterations in reward processing and learning can interact with personality traits, cognition and emotion processing. This work was supported by the German Research Foundation (Deutsche Forschungsgemeinschaft; HE 2597/4-3; 7-3; EXC257), by the Bernstein Center for Computational Neuroscience Berlin (BMBF grant 01GQ0411) and NGFN (BMBF grant 01GS08159).